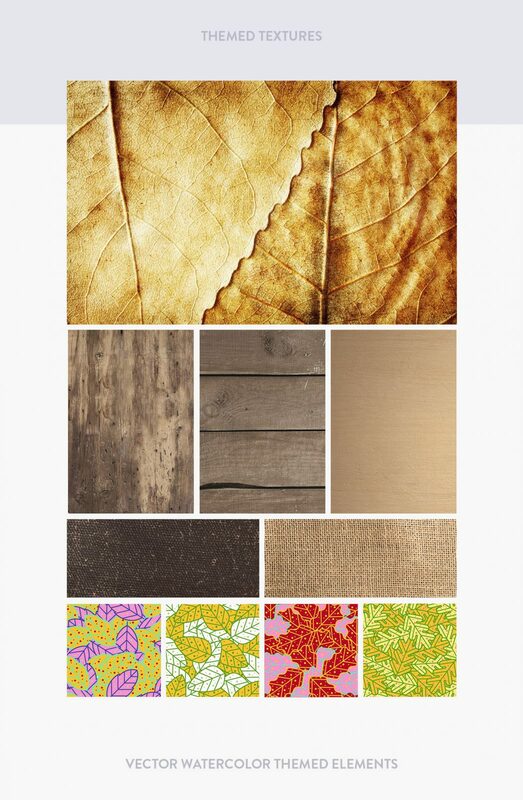 Autumn scene creator will help you bring the feel of autumn to your design works. 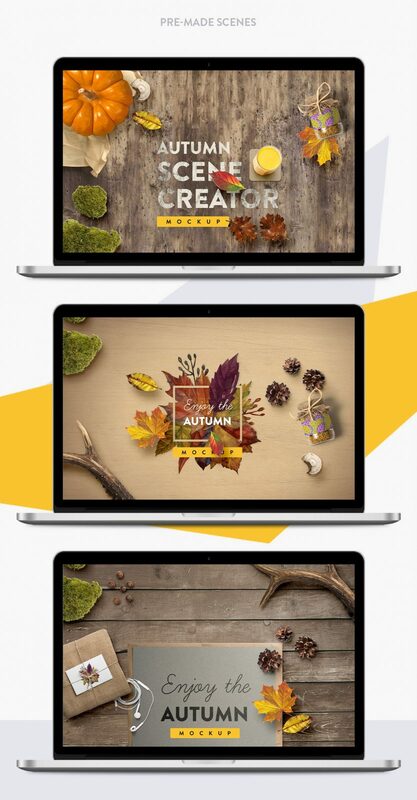 It contains mockup’s, autumn-themed elements, and it’s a free download. This is the first of our packs themed in seasons. We will be updating it as we go forward. And you can expect more seasons themed mockups and scene creators to come. This Free Mockup Scene Creator includes Pre-made scenes ready to use. All the mockups are in Adobe Photoshop format, as .PSD files and were created with layered Smart Objects. It also contains themed textures and vector themed elements. With this mockup pack, you can create very easily and extremely fast new autumn-themed custom images. As designers we all need sometimes a ready to go solution to quickly complete a task, for example, to add a feeling of current seasons, here is where you can really save time with our Autumn Scene Creator. By combining elements together you can quickly generate scenes from scratch or add the included design elements to enhance your own images. So you are saving yourself so much time by using an autumn scene creator. Then you have to perfectly cut them out of the background, color correct. We all know It’s a hustle. And it’s a part of your routine. By using mockups you save yourself precious time and optimize your day to day work. With an autumn mockup, you cover yourself in terms of the whole season for graphical elements. We created this printable free autumn\fall pack to be fully print ready in case you want to design a t shirt. You can create book cover designs, magazine covers, flyers, and posters. The possibilities are limited just to your imagination. Print-ready means good quality when printing is assured. Our fall printables that cover full autumn season is currently a free download. We first thought that creating a year-round pack of assets will come in handy for many designers as well as marketers and SEO gurus. Our plan is to continue expanding our existing assets as well as to add the remaining 3 others: Summer, Spring, and Winter. We also believe that updates are what keeps good products from falling, so expect updates to our packs. We want to thank all the people that are using our assets and promoting our work. We received so many comments and we really did not expect that our assets will blow up that much. We really want to thank every one of you for being a part of this, and wish you happy designing! On our end, we will continue to figure out ways to help design community grow and prosper. An email confirmation has been sent to your inbox. Confirm your subscription by following the instructions there. 1. You get access to our assets right after subscribing. 2. You will get discounts on our upcoming premium paid assets when we release them. 3. You will get an invite to a designer, invite-only Facebook group when it's launched. 4. We have yet to send a single email to our subs. We keep this list spam free and free from pushy marketing; it's for big news, big announcements. Basically, the only news that we ourselves would not want to miss. 5. We don't sell or distribute or share our email subscriber list. And never will. Welcome To The Club And Enjoy Our Assets! Awesome:). That is why I find autumn vector images. Thanks a lot.